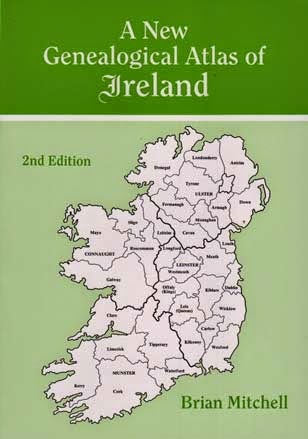 This month's featured book is A New Genealogical Atlas of Ireland, Brian Mitchell (2nd edition). It is available from many online bookshops. Papers Past is the newspaper site of the National Library of Ireland, with access to over 45 million newspaper articles from 93 different New Zealand newspapers, and more are being added all the time. It is located at http://paperspast.natlib.govt.nz/cgi-bin/paperspast. Some of the RootsTech sessions were recorded and can be watched online. The Bedlam Burial Ground register, developed as the result of the discovery of 3000 skeletons during the construction of the London Crossrail can be found at this website. The Early Irish Birth Index and Early Irish Marriage index can be found on the website of the Irish Genealogical Research Society. Choose the "Resources" tab at www.irishancestors.ie and then choose "Unique Resources". The McDonnell's Index of Births, Marriages and Deaths, which includes bmd announcements published in The Constitution and Cork Advertiser newspaper from 1828 to 1830 on http://CorkPastAndPresent.ie The Cork Constitution is not currently included in any of the big online newspaper databases. The full story of the new copy of the Magna Carta that has been found can be read here. The full article about how Spain had planned to invade Australia in the 1790s is available here. Finally caught up. Thanks Jenny.